Ever had had the feeling that the map runs out of resources far to quickly? Well, that will not happen on this map. 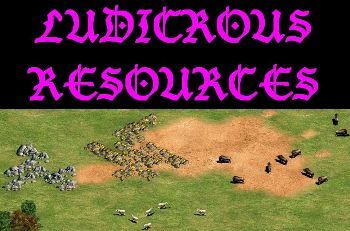 I took the ES@The_Unknown_v2 random map script and greatly increased the size and number and frequency of resource clumps. Basically this gives you a very random map, expect that you will always have an insane amount of resources. I realize that this isn't something revolutionary, so if you are considering wring a review, perhaps take a look at one of my other maps, which are all a bit more unique.